For the US version, see Match of the Day (US TV series). For the Doctor Who novel, see Match of the Day (novel). For the Genesis song, see Spot the Pigeon. Match of the Day is the BBC's principal football programme. Typically, it is shown on BBC One on Saturday evenings during the English football season, showing highlights of the day's matches in English football's top division, the Premier League. In 2015, Guinness World Records recognised Match of the Day "as the longest-running football television programme in the world." It is one of the BBC's longest-running shows, having been on air since 22 August 1964. Although the title was first used by the BBC for its Wimbledon tennis highlights programme in June 1964, the first football-related edition of Match of the Day was screened on BBC Two on 22 August 1964, and showed highlights of a game between Liverpool and Arsenal at Anfield. The programme's audience was estimated at only 20,000, less than half of the attendance at the ground. Match of the Day was not universally welcomed in the football world; in 1965 several clubs attempted to block a renewed deal with the BBC in fear of a drop in gate attendances at matches. Eventually, a compromise was reached where the BBC agreed not to reveal which match was to be shown until after the day's play had concluded. The first colour edition of Match of the Day on BBC 1 was shown on 15 November 1969, where it featured a game between Liverpool and West Ham United. However, the very first colour edition was shown on 2 November 1968 on BBC 2 when a game between Chelsea and Manchester City was featured. Slow motion replays were first introduced in 1969. However, at the end of the decade the BBC lost a significant share of matches, with a new four-year deal in 1979 splitting the rights between the BBC and ITV (ITV had originally won exclusive rights, but a ruling from the Office of Fair Trading ordered that the rights be split). Match of the Day was moved to Sunday afternoons for the 1980–81 and 1982–83 seasons. In 1983, the programme reverted to being shown on Saturday night, although that year four broadcasts were lost due to industrial action. The season 1983–84 also saw the first Match of the Day Live broadcasts of First Division matches, beginning with Manchester United vs Tottenham Hotspur on 16 December – a Friday evening fixture. This came some two months after the start of ITV's Big Match Live. League football highlights were not available to the BBC from 1988 as ITV had exclusive rights, though the programme remained on air for the FA Cup as Match of the Day: The Road to Wembley. League football returned in 1992, for the start of the Premier League era. Sky's emergence made the TV rights market more competitive, with the BBC losing European Cup matches after UEFA's revamping as the Champions League in 1992, although it did broadcast the 1994 final between A.C. Milan and FC Barcelona. In 1997, the BBC lost all live rights to the FA Cup meaning the programme's live coverage was restricted to the UEFA Cup and Cup Winners' Cup matches, the latter competition becoming defunct in 1999. However, the BBC were still able to show Saturday evening highlights of FA Cup games. However, things got much worse for the network when in 2001, the Premier League awarded highlights rights to ITV in a three-year contract. Between 2001 and 2004, the Match of the Day brand was used for the BBC's live football coverage, the network had earned some consolation in losing Premier League highlights by managing to regain live terrestrial coverage of the FA Cup and England internationals for that period. Rights for UEFA Champions League qualifiers, which are held by the home team and fall outside the rights for the competition proper, were obtained on an ad hoc basis for English teams in this period, which is currently the case for the BBC with Scottish and Northern Irish teams. Both legs of Manchester United's 2002–03 third round qualifying matches against Zalaegerszeg were shown live on the BBC. In August 2003, it was announced that from the 2004–05 season, Premier League highlights were returning to the BBC and a revived MOTD. In addition, Match of the Day 2 was launched, which showed highlights of all the Sunday fixtures, and was presented by Adrian Chiles. In 2009, the BBC announced they had retained their Premier League rights, allowing them to continue showing Match of the Day until 2013. Gary Lineker on the current set of Match of the Day. From the 2011–12 season, a new web-only Match of the Day 3 programme was launched on Monday mornings as a light-hearted addition to Match of the Day 2. Although broadcast as a separate programme and with its own unique title, it is recorded immediately following the conclusion of Match of the Day 2 on Sunday night. In November 2011, Match of the Day moved from London to a brand new studio in dock10, MediaCityUK as part of BBC Sport's relocation north, this allowed the programme to be recorded in high-definition. 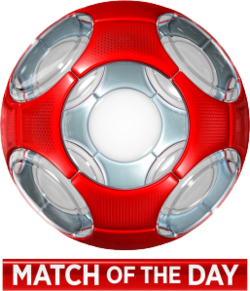 At the start of 2012–13 season Match of the Day 2 moved to BBC One. Upon regaining the FA Cup rights in 2014, highlights from the early and later rounds of the competition were given their own separate programme instead of being broadcast on an extended Match of the Day straight after the Premier League highlights, as it was before the BBC last lost the rights in 2008. Highlights of the latter rounds occasionally sequence from the Premier League highlights, as they did until the previous decade, but both segments are considered separate programmes. Current presenter Gary Lineker took over from Des Lynam in 1999, having served as an analyst during Lynam's tenure. Gabby Logan and Dan Walker have served as stand-in hosts. Each show normally features two analysts. Alan Hansen and Mark Lawrenson featured as the main two analysts up until Hansen's retirement from broadcasting in 2014. Alan Shearer has been the main analyst since 2014, appearing on most shows alongside Gary Lineker. The other main analysts for the 2017–18 season include Ian Wright, Danny Murphy, Jermaine Jenas, Martin Keown and Phil Neville. Other analysts appear occasionally, along with a greater selection of analysts that appear on Match of the Day 2. Match of the Day uses a selection of BBC and freelance commentators, including: Guy Mowbray, Steve Wilson, Jonathan Pearce, Steve Bower, Simon Brotherton, Alastair Mann, Martin Fisher and Mark Scott. In April 2007, it was announced that Jacqui Oatley was to become the first woman to commentate on the programme. Previous commentators have included: John Motson, Harry Carpenter, Jon Champion, Barry Davies, Tony Gubba, Stuart Hall, Alan Parry, Idwal Robling, Gerald Sinstadt, Clive Tyldesley, and Alan Weeks. In August 2014, the BBC announced that as part of the show's 50th anniversary celebrations, Barry Davies would return to commentate for one last time. Criticisms aimed at Match of the Day are its format is tired and out of date compared to Sky Sports' football coverage and new, more enthusiastic pundits are required with the atmosphere between the current presenter and pundits deemed "an old boy's club." In 2010, Wolverhampton Wanderers' American goalkeeper Marcus Hahnemann criticised the show for showing bias towards the bigger clubs in the Premier League, particularly Manchester United. In January 2015, BBC Sport retained its rights to the highlights until the end of the 2018–19 Premier League season. The rights cost £204 million. In January 2018, the Premier League announced that it had awarded the UK highlights to BBC Sport. The rights cost £211.5 million and covers three seasons from 2019-20. The January 2018 agreement also includes Match of the Day 2, Match of the Day 2 Extra, Match of the Day Kickabout, Football Focus, Final Score, and The Premier League Show. The current theme tune for the series is called "Match of the Day" and was written for the programme in 1970 by Barry Stoller. Ironically, Stoller himself admitted that he is not a football fan. Stoller's brief was simply to write "something good"; the short closing fanfare occurred to him first. "Those fanfare harmonies give the music a gladiator feel," he wrote in 2014, "akin to entering the ancient games arena in Rome with all its expectations." The tune was recorded by him, a trumpeter, and a drummer (Stuart Vincent) in the basement recording studio of his home. In May 2010, PRS for Music revealed that the Match of the Day theme tune is the most recognisable in the UK. The theme is often incorrectly labelled "Off Side", the group name of an alternative 1970 version which was released as a 45 rpm gramophone single on the Pye label (7N 25534), arranged and conducted by Mandy Brewer. The original theme tune, entitled "Drum Majorette", was written by Major Oleen Wrigley, the band leader of the Jade Petherick under the pen-name 'Arnold Stock'. Since 1998, the BBC's coverages of the FIFA World Cup and the UEFA European Championship have been under the Match of the Day banner. Between 1995 and 1999, the BBC broadcast Match of the Seventies (1995–96), Match of the Eighties (1997) and Match of the Nineties (1999). Each series acted as a chronological review of seasons through each decade, presented in a slightly off-beat style, and relied heavily on footage originally included in Match of the Day broadcasts. Presenters included Dennis Waterman, Danny Baker, Mark Radcliffe, and Marc Riley. From the 2004–05 season, a second programme, Match of the Day 2, usually airs on the following Sunday. From the 2009–10 season until 2015–16, the BBC picked up the rights for the Football League highlights and up until 2011–12, ten live Championship games and three live League Cup games. Live games were broadcast under the Match of the Day Live banner but highlights were shown on a new dedicated programme named The Football League Show (or, for League Cup games, The League Cup Show). From the 2013–14 season, American channel NBCSN has broadcast its own version also called Match of the Day. From the 2016–17 season, The Premier League Show typically airs on Thursday nights during the Premier League season. A Match of the Day Annual book is also produced. ^ a b Stoller, Barry (22 August 2014). "Match Of The Day At 50: My iconic theme even has a banjo". Love TV. BBC. Retrieved 16 September 2018. ^ "Match of the Day Studio". ^ "Match of the Day named world's longest-running football show". BBC Sport. Retrieved 31 March 2018. ^ a b c "History of Match of the Day". BBC Sport. 14 February 2003. Retrieved 26 July 2013. ^ a b c d e "Match of the Day: 50 years of broadcasting celebration". BBC Sport. 20 August 2014. Retrieved 29 January 2015. ^ a b c d "MOTD through the ages". BBC Sport. 3 August 2004. Retrieved 12 May 2010. ^ "BBC 'sour' over football deal". BBC News. 15 June 2000. Retrieved 29 January 2015. ^ Henderson, Jon (4 August 2002). "Beeb muscle in on United action". The Guardian. London: Guardian Media Group. Retrieved 28 August 2018. ^ "Premiership back on the BBC". BBC Sport. 8 August 2003. Retrieved 24 March 2016. ^ "BBC retains Premier League rights". BBC Sport. 28 January 2009. ^ "BBC". MediaCityUK. Retrieved 29 January 2015. ^ "Match of the Day 2 moves to BBC One". Premier League. 5 July 2012. Retrieved 29 January 2015. ^ "Match of the Day". BBC Programmes. 1 December 2007. Retrieved 31 December 2015. ^ "FA Cup 2014–15: How to follow on the BBC". BBC Sport. 4 November 2014. Retrieved 31 December 2015. ^ "Match of the Day". BBC Programmes. 11 March 2017. Retrieved 8 August 2017. ^ "The FA Cup". BBC Programmes. 11 March 2017. Retrieved 8 August 2017. ^ "'Match of the Day' gets first woman commentator". Reuters. 19 April 2007. Retrieved 16 September 2018. Jacqui Oatley, 32, will make television history when she picks up the microphone for the BBC’s flagship football show at the Premier League game between Fulham and Blackburn. ^ "Match of the Day (1964– ) Full Cast & Crew". IMDb. Retrieved 29 January 2015. ^ "Barry Davies returns to Match of the Day commentary box". BBC Sport. 21 August 2014. ^ King, Dominic (22 January 2013). "Colin Murray has gone... but does Match of the Day need a proper shake-up to close the gap on the champions at Sky Sports?". Daily Mail. London: DMG Media. Retrieved 16 September 2018. ^ Williamson, Laura (9 December 2012). "Wake up Gary, or Match of the Day's old boys' club may close for good". Daily Mail. London: DMG Media. Retrieved 23 January 2013. ^ Laughlin, Andrew (20 September 2010). "Wolves keeper hits out at MOTD coverage". Digital Spy. Hachette Filipacchi UK. Retrieved 16 September 2018. According to Mirror Football, the American keeper is boycotting the BBC's Match Of The Day programme in protest at its portrayal of his team. Hahnemann claims that Wolves are always pushed down to the latter games shown on the Saturday night show, rather than being given top billing. ^ "Premier League awards UK highlights rights to BBC (2016-2019)" (Press release). Retrieved 16 September 2018. ^ "Premier League awards UK highlights to BBC Sport (2019-2022)" (Press release). Premier League. Retrieved 16 September 2018. ^ Sayid, Ruki (11 May 2010). "Match of the Day voted the most recognisable theme tune on TV". Daily Mirror. London: Trinity Mirror. Retrieved 17 August 2013. ^ "Match of the Day". Press Office (Press release). BBC. 24 July 2004. Retrieved 31 March 2018. ^ "Match of the Day Annual 2012: The Best Footy Annual! (Hardback)". BBC Shop. Retrieved 23 June 2012. Motson, John (1992). Match of the Day – The Complete Record since 1964. BBC Books. ISBN 0-563-36406-8.